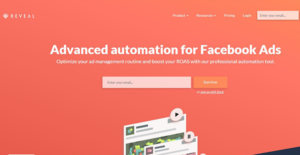 Revealbot is a reliable, AI-powered Facebook and Instagram Ad automation, optimization, and management tool designed for agencies and brands that rely on Facebook for advertising. It is an innovative tool that enables marketers to automate Facebook Ads, notifies them when they waste funds on ineffective advertising campaigns and delivers insights on to how to mend the campaigns. The solution applies machine learning to its core, making it easy to analyze historical data and project CPA and conversions. Revealbot comes with three powerful modules which include automation, auto-boosting, and bulk creation. The automation module allows marketers to create custom rules for ads automation and alerts. Meanwhile, the auto-boosting module enables marketers to promote content and keep control of their audiences and objectives. Lastly, the bulk creation module is designed to streamline the creation of bulk Facebook Ads. Revealbot allows you to create custom automated rules for Facebook Ads, Ad sets, and Ad campaigns. The rules streamline most of your marketing team’s routine with simple actions such as start, set/increase/decrease budget, pause, and bid. Also, Revealbot comes with a powerful log interface that allows you to optimize the rules and analyze results. Besides, the application provides a continuum of metrics such as ROAS, custom conversions, and time metrics. These metrics can be compared and used to improve the performance of your Ad campaigns. In addition, Revealbot is built with a reliable auto-boosting module. This module provides powerful tools that help you promote your content to maximize post reach. Revealbot allows you to stipulate the conditions once and give the solution room to promote the posts for you. It takes the hassle out of the marketing process and enables your posts to get the best possible attention. Better still, it lets you monitor the auto-boosted posts through automatic notifications which are sent in slack, via email, or your Reveal account. Moreover, Revealbot keeps your marketing department in the loop of performance. It delivers a complete analytical overview to your Slack team or inbox from Twitter, Facebook, Google Ads, Google Analytics, YouTube, and MailChimp. Reports from Google Analytics and Facebook can be customized to focus on the most important metrics. Every organization has different requirements and needs a software that can be customized for their size, type of workers and buyers, and the specific industry they are in. For these reasons, no platform can offer perfect features out-of-the-box. When you search a software app, first be sure what you want it for. Read some Revealbot reviews and ask yourself do you desire basic tools or do you require advanced functionality? Are there any industry-specific functionalities that you are seeking? Obtain the answers to these questions to aid your search. There are lots of factors that you need to reflect on and these include your budget, specific business needs, your organization size, integration requirements etc. Take your time, check out a few free trials, and finally zero in on the system that offers all that you want to improve your organization competence and productivity. How Much Does Revealbot Cost? We realize that when you make a decision to buy Social Media Monitoring Software it’s important not only to see how experts evaluate it in their reviews, but also to find out if the real people and companies that buy it are actually satisfied with the product. That’s why we’ve created our behavior-based Customer Satisfaction Algorithm™ that gathers customer reviews, comments and Revealbot reviews across a wide range of social media sites. The data is then presented in an easy to digest form showing how many people had positive and negative experience with Revealbot. With that information at hand you should be equipped to make an informed buying decision that you won’t regret. What are Revealbot pricing details? What integrations are available for Revealbot? If you need more information about Revealbot or you simply have a question let us know what you need and we’ll forward your request directly to the vendor.